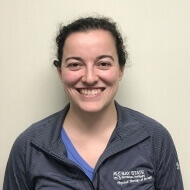 Amanda graduated with her Associates degree as a PTA from New England Institute of Technology in 2016 after receiving her Bachelors of Science in Movement Science and Sport Leisure Studies with a concentration in Sports Medicine from Westfield State University in 2013. She has clinical experience in both the outpatient orthopedic and inpatient/acute care settings. Outside of work, Amanda likes to spend time with her family and friends, traveling, and playing soccer and volleyball.